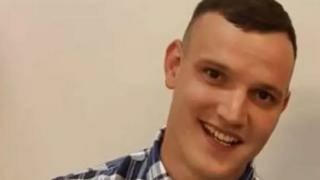 An 18-year-old accused of killing a man in a street fight said he and a friend only resorted to violence as the victim was "egging us on". Robert Williams 18, denies murdering 29-year-old Ronnie Wrighting in Milton Keynes. Mr Williams told Luton Crown Court that he armed himself with a baseball bat when Mr Wrighting turned up on his doorstep on 11 August 2018. "I felt scared," he said. "I didn't want him to smash up the house." Mr Williams, of Tallis Lane, Browns Wood; and Zachary Lemonnier, 18, of no fixed address; deny murder, and an alternative charge of manslaughter, as well as robbery and possession of offensive weapons. The court heard that Mr Wrighting, who lived in Great Linford, was attacked while waiting for a taxi to arrive in Duparc Close, near the junction of Tallis Lane, at about 22:15 GMT. It is alleged that Mr Williams hit him with the bat while Mr Lemonnier set upon him with a kitchen knife. Mr Williams told the court that Mr Wrighting - who had been drinking - turned up on his doorstep as he and Mr Lemonnier were getting ready to go out. "I was telling him to go away but he wouldn't," he said. "He was goading us to come out and fight him, egging us on." The court heard that when Mr Wrighting started throwing punches, Mr Williams ran upstairs to grab his baseball bat but said that Mr Wrighting was "massive" and "nothing had any effect on him at all". He also denied ever seeing a knife and said he did not realise Mr Lemonnier was armed until they returned to the house. Mr Wrighting later died from internal bleeding. The prosecution allege that he was attacked for his watch, which was found in a nearby garden with the DNA of both Mr Williams and Mr Lemonnier on it.